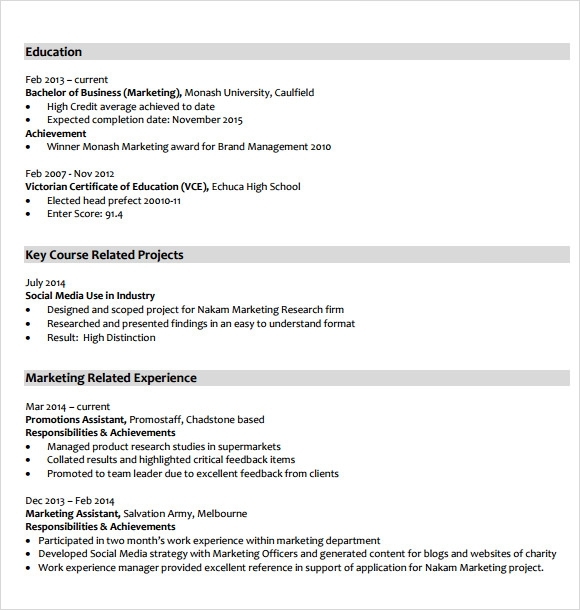 Marketing resume is made by an applicant who wants to apply for marketing position provided that he or she is knowledgeable in handling marketing stocks, trends, issues and analysis. This kind of work position will have to present a formal Resume Templates that will be the initial basis for the employer to become interested with your desire to apply. With the aid of resume template, this will ease the worries of the applicants. The template contains samples related to all kinds of work just like Marketing Resume Templates which will provide details necessary to be put in creating a resume. This tool is useful for any individual intended to get a career job. So, your communication skills are unbeatable. Why not put them into proper use? Grab a marketing communications manager’s job by wooing the best employer around. How? By opting for this amazingly designed Marketing Communications Manager Template. 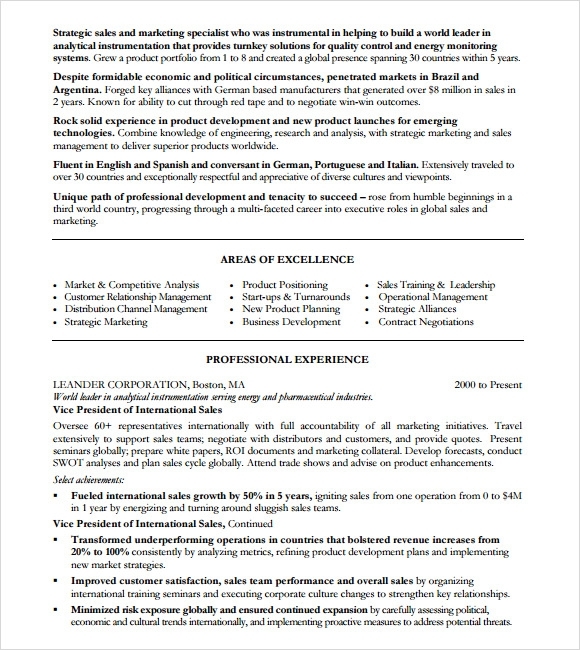 If you think you have the capability to hold the post of a marketing manager in some high-end and reputable company then give wings to your dreams with this Marketing Manager Resume Sample. It’s well designed and well worded. The post of marketing director is, no doubt, lucrative but not everyone is skilled enough to be able to land such a job. 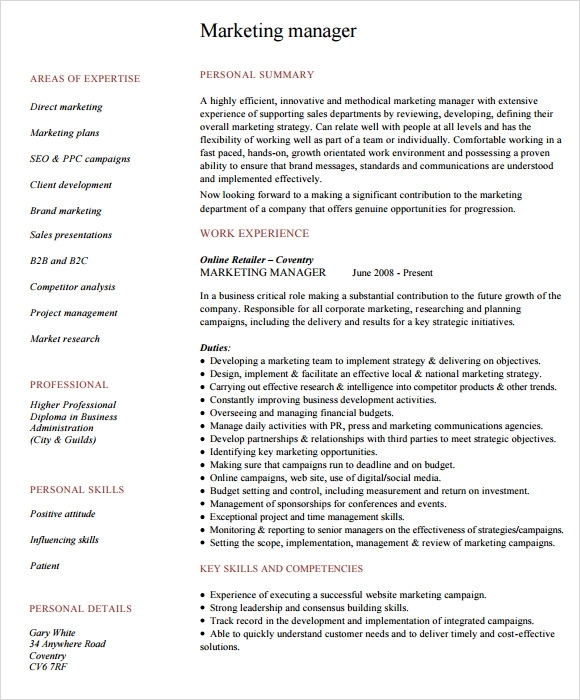 However, you can put your best foot forward by opting for this Marketing Director Resume Template. Getting a business marketing job is not as easy as it might seem. 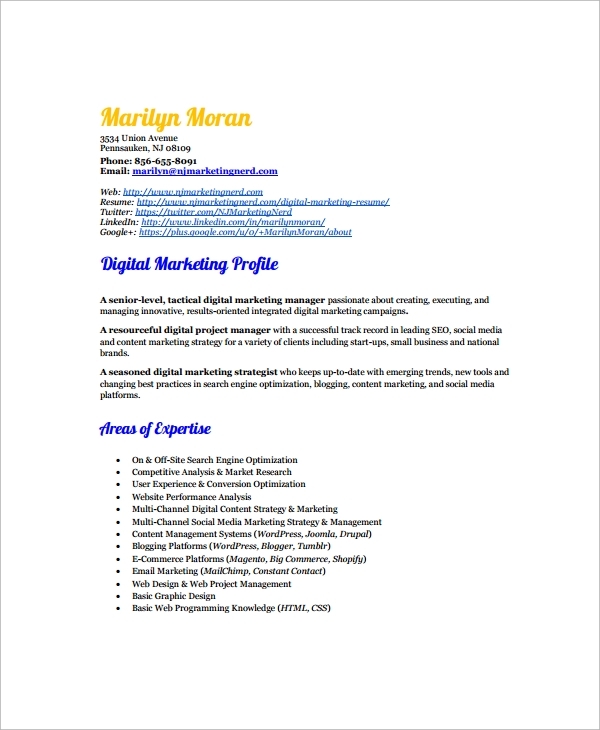 And therefore, you should deliver your best by submitting a great resume prepared using this Business Marketing Resume Template. 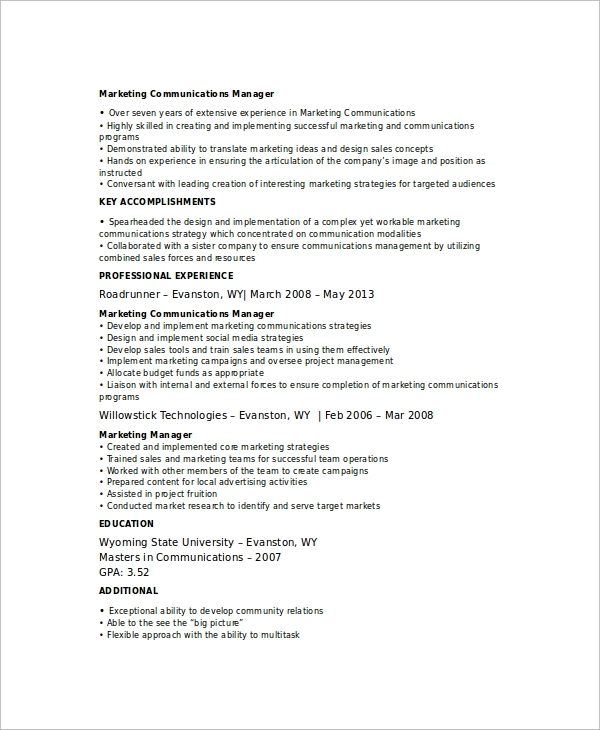 Why do you need a Good Marketing Resume? Marketing is one of those fields where the competition among job aspirants is the toughest. So, contending in this field is in itself a challenge. However, if you want to outshine other candidates then you will have to make a lasting impression on hiring managers, which is possible only with a good marketing resume. You may like Legal Resume Templates. 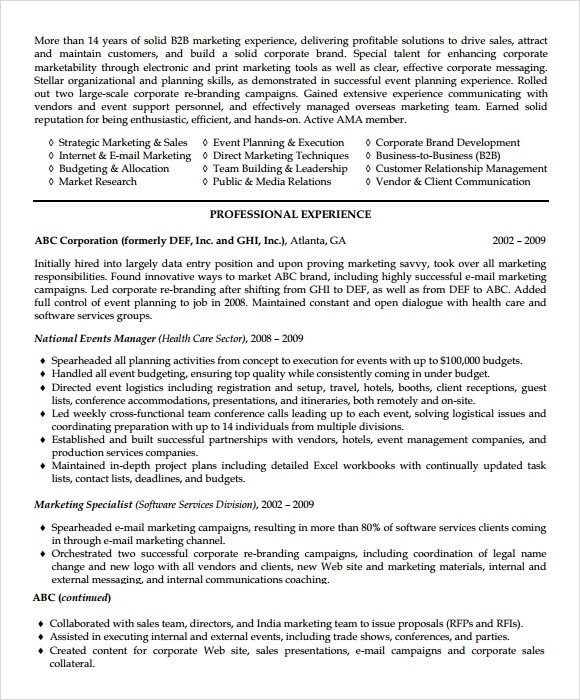 What Makes a good Marketing Resume Template? If you want to make sure your resume appeals to your employer then be sure it is well crafted. Don’t make it too lengthy; it should be crisp and to-the-point. That, however, doesn’t mean you can ignore details. Don’t do that; include every necessary detail in your resume without being too elaborative. Also, make sure the design of the resume is at par with professional standards. 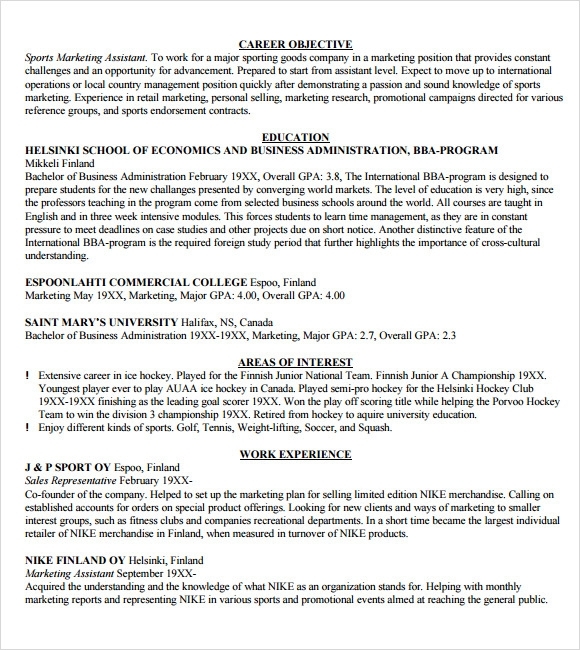 You can also see Sample Resume Templates. For anyone who is time-pressed, templates come as a boon. Also, because they come with a ready-made format, you never feel clueless about what should your resume include. They also save a lot of time for you, which would have otherwise gone into creating your resume from the scratch. Get any of these templates online, without hassles. The availability of a large variety makes sure you are not short of choices. What will excite you more about these templates is that most of them are available for free. Hence, the question of budget doesn’t at all arise.